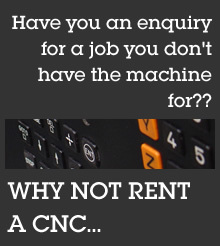 Rent a CNC - Click here now for more info and examples. We will give you 75% of your rentals back when you buy. ! We will undertake the repairs and Service for the machine free of charge (subject to normal use) for the first 30 days of hire, you would take on the service and repairs thereafter. You will need to collect and then return the machine undamaged and in good working order with original equipment supplied – any losses or damage would be charged at cost. Installation and commissioning would be extra at cost. Acceptance for rental is subject to status. In general, rental would be 5% of the purchase price of the machine per month plus vat as advertised on our website www.craigstrong.com, although some lower value machines may be slightly higher, but please ask for a quotation. - you have nothing to lose. e lower value machine may be slightly higher but please ask for quotation – you have nothing to lose. lower value machine may be slightly higher but please ask for quotation – you have nothing to lose.me lower value machine may be slightly higher but please ask for quotation – you have nothing to lose.me lower value machine may be slightly higher but please ask for quotation – you have nothing to lose.